The island of Pathiramanal is located on the Backwaters. The beautiful island lies between Thanermukkom and Kumarakom. It can be accessed by boat only. One can find many birds as it is a haunt of hundreds of rare migratory birds from Siberia. It is surrounded by the Vembanad Lake and stretches from Alappuzha to Kochi and the Kayamkulam Lake. It is a favorite place for those who move for backwater cruise. Pathiramanal means “sands of night” and the beach at Pathiramanal really fulfills its name describing beauty. The beach is the major attraction on this island. 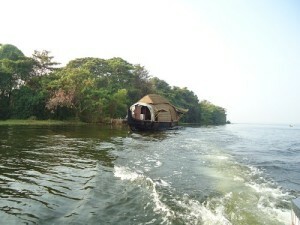 The mainland is Alappuzha and it is a great network of lakes and lagoons. One will find this nature loaded place a suitable natural retreat. One can make a journey through the backwater and this island to get immense pleasure. The beauty of the Vembanad Lake, the backwater and the green island all create the most scenic spot of the world. The beach on this island is quite scenic and can be accessed to study nature at the peak of its beauty. The beautiful sandy beach is fringed with many palm trees. The greenery spread throughout the beach leaves the visitors spell bound. The nearby Vijay Park is the most wonderful place to spend quality time on the Pathiramanal Beach. The sea encircling the island is calm and one can get amazing sightseeing on the beach. It is indeed a suitable place to unwind and relax amidst natural sites. One will not find many of the sports and activities to keep one engaged on the beach. But there are enough facilities for enjoying the boating. Boating can be a major source of entertainment. The calm and serene atmosphere of the beach is great for enjoying a boat ride. As the sea is a little calm here, one can enjoy simple boat ride to the sea. The nearest light house is another interesting spot for the tourists. One can visit the light house during the day visit. This proves to be quite engaging for the tourists. The boat building yard is another place that attracts the tourists the most. Now days, this is using the teak from Malaysia for the construction of Arabian trading vessel. Visiting the boat building yard is unique to this place only. Alappuzha is the nearest railway station. The Nearest airports are the Cochin International Airport, which is located at a distance of 85 km north of Alappuzha and another airport is Thiruvananthapuram, located about 150 km towards the south. One can hire taxis from the station and airport to reach the beach.